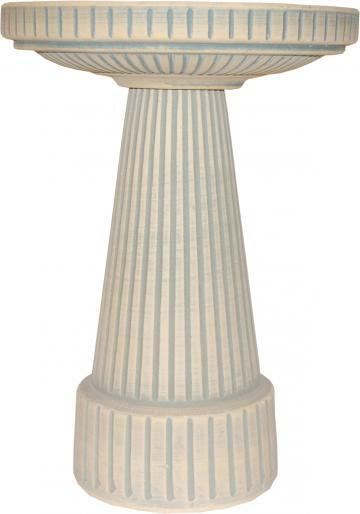 A shaded light blue finish is on this Universal bird bath Pedestal ONLY. 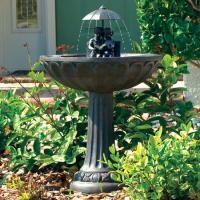 Our clay birdbaths are pottery with a passion. 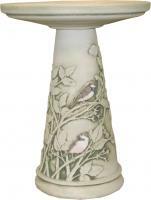 Using clay from Ohio mines and processing it into a stoneware body, firing it in kilns and finishing it with our beautiful hand painting truly makes this the only U.S.A produced clay birdbath. Very disappointed with this birdbath. 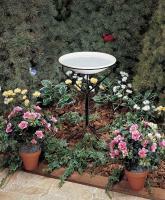 The basin portion just sits on top of the pedestal - very precariously, might I add. I have never had a birdbath that did not have some way to secure the top to the bottom with either a rubber grommet set in the neck of the pedestal or a twist and lock construction. Furthermore, it is almost impossible to clean. The basin almost immediately became stained and slimy even with a water "jiggler" on constantly. It is also very small, birds have a difficult time trying to actually splash and bathe. HORRIBLE in every way. I called the minute I opened the box to complain about the lack of a way to secure the top to the bottom and was told that they had never had this issue and were not aware of any other design. Would have taped it right back up and returned it but I certainly was not going to pay for the shipping cost. Very disappointed. I have since purchased another bath of much higher quality and far better design elsewhere, and at a better price.